The Azure Site Recovery service contributes to your business continuity and disaster recovery (BCDR) strategy by keeping your business apps up and running, during planned and unplanned outages. Site Recovery manages and orchestrates disaster recovery of on-premises machines and Azure virtual machines (VMs), including replication, failover, and recovery. This quickstart describes how to set up disaster recovery for an Azure VM by replicating it to a different Azure region. This article is as a quick walkthrough for new users. It uses the simplest path, with default options and minimum customization. For a fuller walkthrough review our tutorial. Log in to the Azure portal at https://portal.azure.com. In the Azure portal, click Virtual machines, and select the VM you want to replicate. In Operations, click Disaster recovery. 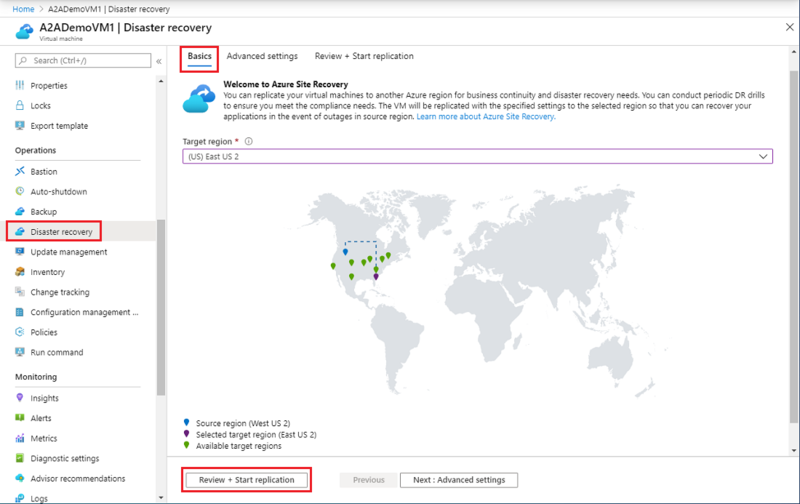 In Configure disaster recovery > Target region select the target region to which you'll replicate. For this Quickstart, accept the other default settings. Click Enable replication. This starts a job to enable replication for the VM. After the replication job has finished, you can check the replication status, modify replication settings, and test the deployment. In the VM menu, click Disaster recovery. You can verify replication health, the recovery points that have been created, and source, target regions on the map. The source replication settings are cleaned up automatically. The Site Recovery extension installed on the VM as part of the replication isn't removed, and must be removed manually. Site Recovery billing for the VM stops. In Disaster recovery, click Disable Replication. In this quickstart, you replicated a single VM to a secondary region. Now, try replicating a multiple Azure VMs using a recovery plan.